» Faculty of Medicine » Home » Department Member Resources » Information Technology » Getting Going » Connecting to your office computer, from elsewhere. Department members, who have a supported Windows computer, in Detwiller, Purdy or Koerner Pavilion, can connect to it from many other locations, just like you are sitting in front of it. 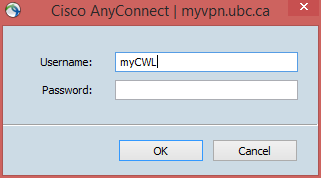 It is possible to connect from computers on UBC networks, including UBC Wireless, home computers and other locations. The computer computer in Detwiller, Purdy or Koerner Pavilion need not be a full desktop computer setup (e.g. no monitor is required). Note: Remote connection from hospital computers is not possible, due to hospital security restrictions. Request approval, for remote access to your office computer, from your supervisor. 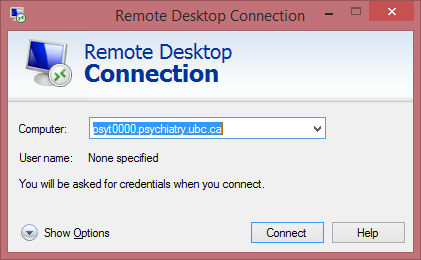 When in your office, note your computer’s asset number, from it’s label and contact Psychiatry.IT@ubc.ca with your asset number and computer logon account name, to have remote access to your computer enabled for your account. Save this asset number, for use at the remote computer. Log-off or restart, your Detwiller/Purdy/Koerner Pavilion computer, but leave it running. If your remote computer uses Apple OS X, you will also need to download and install “Microsoft Remote Desktop” from the App Store. Get internet access. This may be a wired or wireless network. Note: While the Cisco VPN client is connected, you will be unable to access local network resources, on your remote computer. For example you will not be able to copy a file from a home computer, to your office computer. Apple OS X – start the application called “Microsoft Remote Desktop”. Microsoft Windows – start the Remote De sktop Connection program (built into Windows). Using the remote desktop software connect to your Detwiller/Koerner/Purdy computer, by entering it’s name “psytnnnn.psychiatry.ubc.ca”, where “nnnn” represents your computers asset number. Select “Other” user and enter your Detwiller/Purdy/Koerner computer user name and password. Log out of your office computer, as you usually would. This will return your remote computer’s desktop. Quit the Cisco AnyConnect application/program. This will return access to devices on your local network. If your remote network connection is slow, try reducing the number colours. 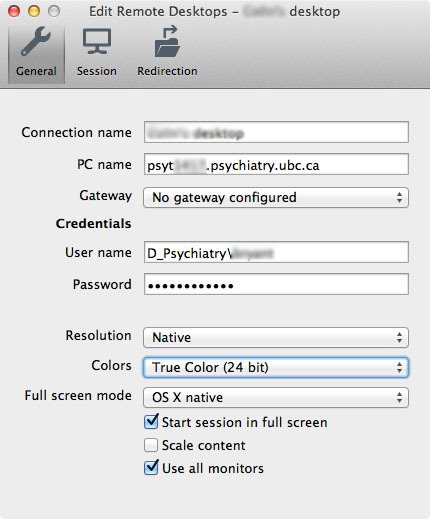 Mac – In Microsoft Remote Desktop select your remote desktop profile and change the colors setting to have less “bits”. Windows – Before logging onto the remote desktop, click “show options”, in the lower left corner. On the Display tab, reduce the colour “bits” setting. Other people will not be able to use your Detwiller/Koerner/Purdy computer, while you are connected from a remote location. You will be able to logout of your Detwiller/Purdy/Koerner office computer, but you will not be able to shut it down, or restart it.